Many people wonder how many calories an egg contains and some people are worried about egg’s cholesterol and fat content. One medium raw egg contains about 63 calories. However a larger or smaller egg has a different amount of calories. Also, boiling, frying or scrambling the egg affects the total calorie content. According to research, eggs are a versatile food that are high in good quality protein, vitamins, minerals and healthy omega-3 fatty acids. In fact, eggs are healthier than most people imagine and don’t have as many calories as you might think. Therefore, eggs should be an important part of a well-balanced, healthy diet. A raw egg can contain anywhere from 63 to 90 calories, depending on its size. In addition the way you prepare the eggs affects the total calorie content. Boiled and poached eggs contain fewer calories and fat than fried and scrambled eggs that are fried in oil or have milk added. Even though eggs are high in cholesterol, they contain mostly unsaturated fat, which is essential in a healthy diet. In fact, as you will see in this article, most people can eat up to 6 eggs a week without increasing their risk of heart disease. In order to make wise choices when it comes to your diet, it’s important to know the calorie content of eggs. In this article, you will learn about the best way to incorporate eggs into a healthy diet and what kind of health benefits eggs provide. The number of calories in a hen egg depends greatly on the size of the egg. Chicken eggs can range in size from small eggs weighing about 40 grams to jumbo size ones weighing about 70 grams. The average sized egg (about 50 grams) contains around 70 calories. Medium egg (44 grams) has 63 calories. Large egg (50 grams) has 72 calories. Extra-large egg (56 grams) has 80 calories. Jumbo egg (63 grams) has 90 calories. Depending on how you cook eggs and what you serve them with, the calorie count may rise significantly. Remember, if you are serving hard-boiled eggs as part of a salad, ingredients like salad dressing, mayonnaise, or other sauces will increase the overall calorie count of the meal. Remember, if you add butter, other fats, or cheese to the cooking process, the number of calories in scrambled eggs will increase even more. Dr. Francisco Lopez-Jimenez from the Mayo Clinic says that the risk of heart disease is usually associated with the food accompanying fried eggs, not the fried eggs themselves. For example, bacon, sausages, and ham all contain high levels of sodium, saturated fats or oils with trans fats.7 One interesting point to note is that bacon, sausages, and ham are also some of the top 5 cancer causing foods. Most of the calories in eggs, as well as all of the fat content, is in the yolk. The yolk in a large egg contains about 55 calories and just over 180 mg of cholesterol. An egg white contains 17 calories and no fat content at all. Nutritionally, egg whites contain fewer minerals and vitamins when compared to an egg yolk. However, most of the protein comes from the egg white. Eggs are a cheap and rich source of many vitamins, minerals, and healthy fats. 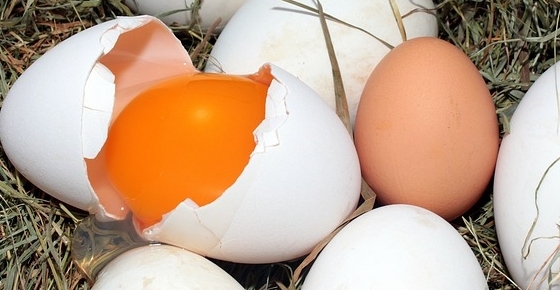 Let’s look more closely at why eating eggs can be good for you. Amino acids are needed by the body for proper cell regrowth and affect the body’s production of hormones, enzymes, and hemoglobin. Because your body can’t store amino acids, you need to have a daily supply of these to help keep your overall health in good shape. One of the reasons that eggs have received a bad rap is because of their cholesterol content. While one egg contains about 186 mg of cholesterol, the question is: should you be concerned about the cholesterol in eggs? Actually, there are many myths surrounding cholesterol and “good” cholesterol is actually necessary for many functions in the body. Of course, to look after your general health you should limit foods in your diet that are high in “bad” cholesterol and saturated fats and at the same time increase your fiber intake. Making wise dietary changes in your daily life is an effective way to lower your cholesterol naturally. It is clear that eating eggs has many health benefits. Eggs are good for your general health because they provide lots of good protein, vitamins, and minerals and can actually lower levels of “bad” cholesterol. Many studies have shown how by consuming eggs you can help to prevent certain diseases and actually improve some health conditions. In fact, the protein, vitamin, and mineral content of eggs don’t just have many health benefits. You can also use egg yolks and egg whites to help keep your hair shiny and healthy. The high protein content of eggs can be a helpful addition to your diet if you suffer from bouts of gout. Eggs are one of the best sources of protein that have a very low purine content.14 Purines get broken down in the body and form uric acid which can lead to gout. Therefore, eggs are the perfect food to help reduce flare-ups of gout and prevent the condition. They provide plenty of protein, vitamins, and minerals to keep your body healthy and prevent hunger pangs. For more helpful advice on how to get rid of the painful symptoms of gout, please read my article on the best natural treatments for gout. The U.S. National Library of Medicine (NLM) reported on a study that eggs could help to lower the risk of stroke. The study found that by eating one egg a day as part of a healthy diet, the risk of stroke is lowered by 12%. USDA. Egg, whole, raw, fresh. USDA. Egg, whole, cooked, hard-boiled. USDA. Egg, whole, cooked, poached. USDA. Egg, whole, cooked, scrambled. USDA. Egg, whole, cooked, fried. MayoClinic. Are chicken eggs good or bad for cholesterol? NutritionData. Egg, whole, cooked, hard-boiled. Am J Clin Nutr. 2015 Apr;101(4):705-13. Am J Clin Nutr. 2011 Dec; 94(6): 1584–1591. NLM. Eating one egg a day may lower risk of stroke. The WHOLE cholestorol issue brought on by the profit elitists is a complete and total HOAX!!! Stop believing everything you see, hear and read. Do you’re own research, people. Most of the labratory tests put out to the public are simply based on fear and profit. Yet, most SHEEPLE fall for the crap. I guess you GET what you got coming! !